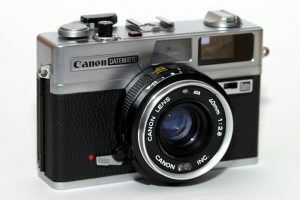 The Canon Datematic was a compact rangefinder camera introduced by Canon in 1974, which offered programmed autoexposure (powered by two mercury cells) and a 5-element 40mm f/2.8 lens. But the novel feature was optional date imprinting onto the bottom right corner of the film frame. There is no clock onboard, and so the numbers shown atop the lens barrel must be changed manually when the feature is wanted. Two-digit years only reached up to „83,” although a blank space or 0-9 are also possible. When using a matching Canon electronic flash, the aperture setting adjusts according to the distance focused, giving correct exposure automatically.